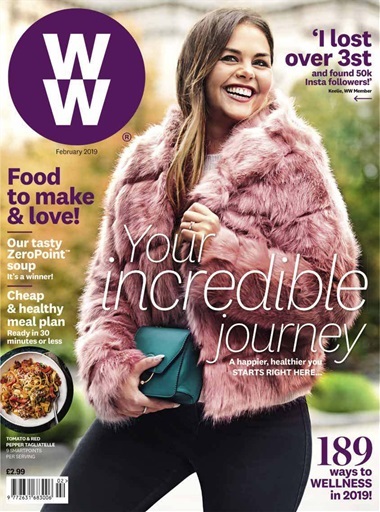 Welcome to the new-look February issue of WW magazine. This month, we’re focusing on joy and new beginnings with stories about inspiring WW Members at home and abroad, indulgent recipes you can include in your healthy meal plan, and expert advice on making 2019 your happiest and healthiest year yet! From the power of sharing get-healthy goals with a friend, to stepping – or should we say swimming? – out of your comfort zone, the success stories in this issue are sure to boost your motivation. We hang out with besties Keeli and Jo, who share how they made wellness a joint effort. They talk shared passions, daily routines, and how their Instragram posts have attracted more than 70k followers between them! Then there’s Helen, who found the courage to jump in at the deep end with a bunch of wild swimming enthusiasts. We also go global, checking in with WW Members from Germany, Australia, France and the US, who each reveal the key lessons they’ve learned during their wellness journey. Thought indulgent dishes are off limits? Wait until you’ve tried our giant jaffa cake, or the succulent chicken dish created by Michelin-star chef Marcus Wareing. We’re continuing the feel-good food theme with comforting recipes from the latest Healthy Kitchen cookbook (melt-in-the-middle fishcakes, anyone? ), three dinner-time saviours you’ll rely on time and again, a hearty weeknight meal plan and new ways to dress up a simple soup. There’s energising ideas to refresh your fitness routine, and we step inside the closet and home of stylish WW Member Gemma to discover how she developed her signature look. Also, our beauty expert reveals how to beat the chill with soothing skincare buys, and we explore how to put your wellbeing first by finding the confidence to say no.